When Chumby, makers of the boutique gadget of the same name (a sort of cross between an alarm clock radio and digital picture frame, housed in a leather ‘bean bag-esque’ casing), announced that is was porting its widget-based platform to third-party hardware, the emphasis was on Internet-connected TVs, Blu-ray players and set-top boxes. Now it seems that the first ‘powered by Chumby’ device will be something much closer to the company’s own hardware: a digital picture frame, to be released in time for the holidays, reports Forbes. Hoping to move beyond being a geek’s favorite boutique gadget to something more mainstream, Chumby is partnering with chip maker Broadcom to make it easy for consumer electronics companies to embed its widget platform into Internet-connected TVs, Blue-ray players and set-top boxes. 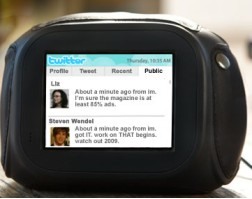 Chumby’s content, which is currently available on the company’s own Internet-connected device – a cross between an alarm clock radio and digital picture frame – consists of “over 1,000 widgets in 30 different categories” such as news, entertainment, music, and sports. Content partners include CBS, MTV Networks, The New York Times, Pandora, The Weather Channel Interactive, and AOL’s SHOUTcast and Scripps Networks. Chumby can also access “thousands of Internet radio stations and podcasts”, along with a user’s own content and that shared by friends within their Chumby social network. Of course, Chumby’s platform isn’t the only TV widget offering, with Yahoo’s Widget Channel making a big splash at this year’s Consumer Electronics Show (CES). Internet-connected TVs and accompanying widgets were also the talk of CES in 2008 – back then Sharp, Samsung, Panasonic and Google made related announcements, although not much seems to have materialized since then, suggesting that the market for Internet widgets on the telly is far from proven. In that sense, Chumby isn’t too late to the game.